AUTHOR'S NOTE: I humbly apologize for not putting this review up sooner while this exhibit was on display. My editor (read: mother) and I were at odds with how much history I chose to include in this review. I am quite interested in not only the artist in question, but also in the particular history of Leonardo's attempts at sculpture and the techniques he himself developed to execute his ideas. This is the original review, and I hope my readers find it interesting as well as coherent. One fine day my mother pointed out to me the signs that lined the roads of our fair city of Los Angeles. These signs advertised an exhibit (running at the Getty Museum from March 23 to June 20) on the one of the great masters of the Italian Renaissance: Leonardo da Vinci himself. Since the Italian Renaissance is my artistic forte, I was completely ecstatic. Leonardo da Vinci (b.1452-1519) is one of the most famous, influential, and well known artists the world has ever seen. But he is definitely known for his incredible contribution to the art of painting, and so I was intrigued when I learned that the exhibit would be about his contribution to sculpture. Leonardo da Vinci did dabble in sculpture during his not-so-prolific career, but no sculptures exist today that can definitively be attributed to him. This lack of sculptural output is largely due to his ambitious designs not being allowed by circumstance to see the light of day as well as Leonardo’s tendency to grow bored with his projects and leave them unfinished. An example of his failed sculpture was the commissioned bronze equestrian monument to Francesco Sforza. Leonardo’s drawings for the monument indicate his total revitalization of the equestrian sculpture formula, which depict both horse and rider in bold motion. Due to the size and complexity of his design, Leonardo had to develop a new method of casting the bronze (and his failure to do so would earn him much ridicule) and he built a vast clay model of the monument which was displayed in Milan. Unfortunately, Leonardo’s dream never came to fruition because Milan went to war and all of the bronze in the city was needed for the war effort, leaving none for Leonardo to cast his massive sculpture. The clay model remained on display, slowly withering away, until the French soldiers who occupied Milan destroyed it. As a result, Leonardo didn’t attempt sculpture again and even looked down upon it as inferior to painting (which fueled the rivalry between him and his contemporary Michelangelo). This exhibit at the Getty, however, revealed Leonardo’s lasting influence on Renaissance sculpture by virtue of his innovative designs. On display is the Saint Jerome by the first master of Renaissance sculpture, Donatello, as well as many of Leonardo’s drawings and sketches for equestrian monument, caricatures and religious figures, some with his famous cryptic backwards writing, and to my surprise, one of his early Florentine works: the unfinished painting of Saint Jerome in penitence, whose sculptural, dimensional and dynamic quality reveals the influence of sculpture on the young Leonardo. The true key to understanding what Leonardo’s sculptures would look like (if any existed), however, lies in the work of his friend Giovan Rustici, also on display, who was greatly influenced by Leonardo’s drawings. An example of Leonardo’s influence on the less-known Rustici can be found in the sculptures by Rustici that echo Leonardo’s lost fresco, “The Battle of Anghiari”. Leonardo painted the fresco in Florence in competition with Michelangelo, who wanted to prove himself a better painter than Leonardo. 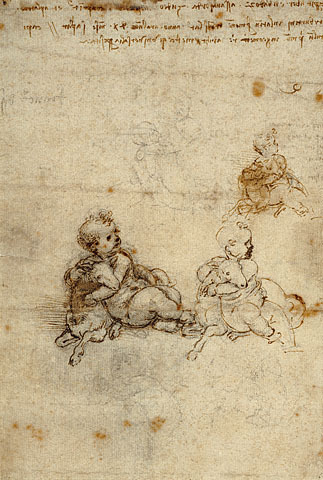 The cartoons hung side by side and attracted and influenced a whole new school of artists, including Raphael. However, the frescos sadly do not exist today. Leonardo liked to work slowly and in oil, and the technique of fresco painting requires the painter to work quickly and complete large sections at a time as the paint sinks into the wall plaster. Leonardo devised a method to allow him to work how he liked by using furnaces at the base of his painting to dry the paints to the wall (which was important since his wall painting “The Last Supper” is still flaking off the wall even today). However, the size of the mural juxtaposed with the heat required to dry the top of the mural led it its ruination. The heat pulled all of the colors to the bottom of the fresco, thus ruining it. Michelangelo abandoned his rival fresco when he was called to Rome by Pope Julius II, so his fresco does not exist today, and the cartoons are lost to us as well. However, we can get an idea of what parts of the frescos were to look like due to copies of the cartoons that still exist. An indirect copy of Leonardo’s cartoon, attributed to Peter Paul Rubens, the Flemish master, displays a revolutionary and incredible battle on horseback. Upon viewing Rustici’s small bronze miniatures, it is clear that the passion and fury that existed in Leonardo’s lost work are echoed in the work of his friend and colleague. Aside from the happy surprise of the Saint Jerome painting, the highlight for me was the large amount of Leonardo’s drawings, which contained every technique from finished, detailed sketch to quick “doodle” that captured the bare essentials and movement quality of the figure (in this case a horse). Some of the drawings were anatomical studies, some were portraits, and all were masterful. This exhibit demonstrated how although there are no existing sculptures by Leonardo, his new techniques and designs for sculpture proved quite influential on future generations of sculptors. As a Renaissance enthusiast, I found this exhibit interesting, but it did not really present many new insights. However, I am always game to see Leonardo’s drawings and paintings, and for those who are interested in Leonardo, it should not be missed. I quite enjoyed the history, so thank you for including it! Both interesting and coherent. I especially enjoyed the story of Leonardo and Michaelangelo's schoolboy-like rivalry.